Columbia Police Chief W.H. ‘Skip’ Holbrook announces that investigators have identified a suspect accused of shooting at a man after an argument on a heavily traveled roadway. 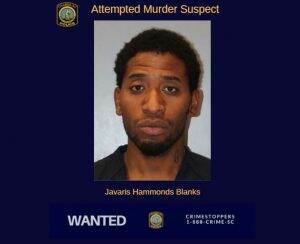 Officers have outstanding arrest warrants for 30-year-old Javaris Hammonds Blanks (DOB: 6-11-1988). Once located and arrested, he will be charged with Attempted Murder and Possession of a Weapon during the Commission of a Violent Crime. The arrest warrants have been entered into the National Crime Information Center (NCIC) database. On April 12, 2019, Hammonds Blanks is accused of arguing with a male acquaintance and displaying a gun while driving along the 400 block of Greystone Boulevard near the I-126 overpass. As the victim got out of the vehicle to run to safety, Hammonds Blanks allegedly fired multiple rounds at him. No one was injured during the incident. A witness provided valuable information to CPD officers to aid the investigation. Crime scene investigators also collected evidence from the incident. LOG onto: www.midlandscrimestoppers.com, and click on the red “Submit a tip” tab. DOWNLOAD the new P3 Tips App for Apple or Android devices.